Chinese smartphone maker Oppo has yet again teased its upcoming bezel-less device, the Oppo R15. This time, some of the key specifications of the phone are also out as it has been certified by TENAA, China’s telecommunication authority. Earlier, the company teased the phone with a notch and a full-screen display. This time too, Oppo has released a teaser video of the device. The Oppo R15 is showcased to come with an iPhone X-like notch, and dual rear cameras. Apart from that the device is certified by TENAA with model numbers PACMoo and PACToo. Already teased by the company, the design and looks of the Oppo R15 are not much of a surprise now. The device is confirmed to come with a bezel-less display with a notch on the top and dual rear cameras. The company has confirmed a 90% screen-to-body ratio for the phone. To start with, the phone is tipped to come with a 6.28-inch Full HD+ (2280 x 1080p) resolution. It will be a full-screen AMOLED display with a small notch at the top. 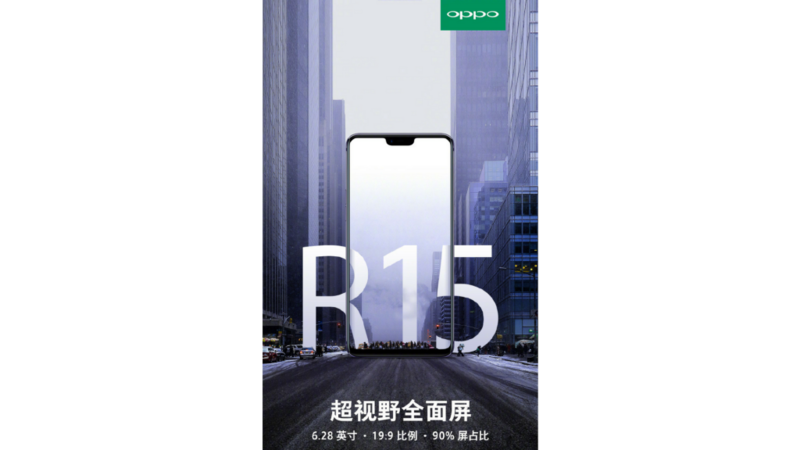 The TENAA listing has also mentioned the Oppo R15 featuring a glass back and a metal frame, shedding some light on the premium features here. Coming to optics, you may get to see dual rear cameras on the device. The camera combination is tipped to be a 16MP primary lens accompanied by a 5MP secondary camera with dual tone LED flash. A 20MP front camera may sit above the display in the area of the notch. In terms of hardware, the Oppo R15 is tipped to be equipped with a Snapdragon 660 Octa-core processor, coupled with Adreno 512 GPU. This combination may be complemented by 6GB RAM with 128GB internal storage and up to 256GB expandable memory. This phone is also expected to run the latest Android 8.1 Oreo with ColorOS on top. Leaked to come with a 3365mAh battery, the Oppo R15 may come with USB Type-C, 4G VoLTE, WiFi, Bluetooth, and GPS as some of the connectivity options. The phone is tipped to come in Black, White, and Blue colours.